You’ve seen it at the car shows. Peering down into an event-winning engine compartment you see the reflection of yourself in the valve covers and intakes. Probably cost the guy a fortune sending those pieces out to be chromed. Look a little closer; chances are those valve covers, intakes, and carburetors have simply been polished and you can do this yourself. Chrome is nice, but it is hard to beat a nicely detailed engine compartment with all of the aluminum parts polished. Contrary to popular belief this does not require a hefty investment in specialized equipment; chances are you already have everything you need in your garage already. Sure, people will send pieces out to be chromed but chroming can end up looking gaudy if not done tastefully and it is very expensive. Polished aluminum on the other hand looks clean and functional. What overall effect do you want to achieve? It is important to consider the overall 'look' you would like the engine compartment to have. Essentially you are creating a "package" or "image". Having a shiny alternator in an otherwise detailed engine bay will only attract attention to how clean (and dirty) your engine is. In the beginning it may be difficult to visualize end, you will be glad you spent the time. Take notice at the next car show or cruise night your at. Stop for a second and take in the whole engine bay or suspension. Remember what parts "jumped" out at you, and what parts you did not notice until you stared at it. Ultimately it is a game of misdirection. Highlight what you want to show off, hide what you don’t. The theory behind polishing aluminum is similar to any type of polishing. Essentially you are attempting to replace large scratches and imperfections with finer and finer scratches until the scratches are so fine the human eye does not see them. As a final step on metal, the surface is de-oxidized to remove any tarnish. The length of time it takes to polish a piece is proportional to the complexity, size, original quality, and the standard of results you want to see. Parts with complex inside curves will take longer to polish than relatively flat pieces. Large pieces will take longer than small ones. Parts that begin as rough castings will take longer than those that are machined. If you insist that all surfaces of the part (such as the underneath of intakes which can’t be seen) need to be polished then you can considerably increase the time taken to polish the part. Generally speaking, and unless you are attempting to win the Ridler Award at the Detroit Autorama, it is entirely sufficient to polish showing surfaces only. What tools are needed for polishing? The short answer is sandpaper and elbow grease. There are a few additional power tools that will help the job immensely: an electric orbital sander, an electric drill, an electric detail sander, and a Dremel tool. Examine the part and consider how the curves flow and how the edges are made. When you are sanding and polishing it is extremely easy to completely wipe out a contour or edge. Often what you will want to do is to enhance a curve or an edge, or completely remove a casting line. In some cases you will find leaving a dividing line may enhance the over-all look of a part. It is this attention to detail that separates a collection of shiny parts from a beautifully executed, show winning, engine compartment. Hold on, professionals use a buffing machine, isn’t one of those needed too? Well the short answer is no. The reality is that these machines can substantially reduce the work involved though. If you have access to a buffing machine, or you are thinking of purchasing a machine, consider the following. The same initial preparation of the metal must be done. 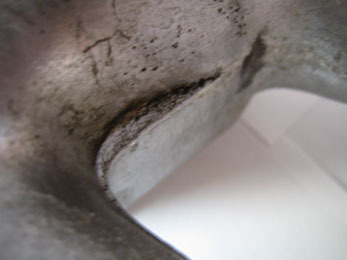 Rough castings should be removed and pitting from the casting process must be removed. The advantage of a buffing machine comes into play the closer to final polishing you get, considerably reducing the amount of effort required to get that final shine. By using progressively finer compounds on the buffing wheels, these buffers take the place of the intermediate to final sanding grits and tarnish removers. There is no guarantee of a better result, in fact, if used carelessly they can blunt fine edges on pieces. So what parts are good candidates for polishing? On the early 70-83 L-Series motor start with carburetor bodies, float chambers, intakes, valve-train cover, front engine cover, and distributor housings. Intakes on later vehicles are aluminum too. Generally, the clutch master cylinder and brake master cylinder can be polished as well. Original Nissan oil pumps on the L-Series motors are aluminum and polish nicely. Even ‘pot-metal’, a mixture of metals, can be polished. If the part rusts, then you probably don’t want to polish it. It is worth taking a few moments to discuss metals and how they respond to sanding and polishing. Cast: Parts that are made through the sand casting process will have deep pits and often there is casting flash (the gaps from the molds). The metal used in the casting process is not always known; it might be aluminum or it might be recycled pop cans. The down side to cast parts is that you don't know what is underneath. 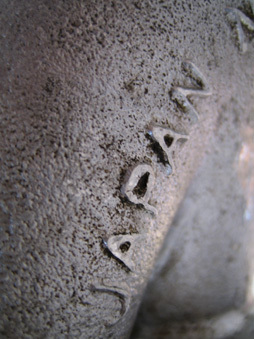 As you sand, you might uncover more pores in the metal. The rule of thumb with cast parts is that you get what you get. Don't worry if there is a pit here or there as in the bright sunlight you will not notice. Cast parts can also come in a smooth finish. Valve covers are an example of this. This is more costly to manufacture than a sand casting method due to the molds that need to be created. The surfaces are smoother and cleaner compared to cast. As well, you may notice a "flow" to the metal. Often when you polish, you will unveil patterns in the metal that result from how it flowed and cooled in the mold. Keep in mind you are 2 inches away, and the audience will be many feet. Machined: These are parts that are made from a block of metal/alloy and then machined into the required shape. The advantage with machined parts is that the original block of metal was high quality and non-porous. An example would be 6061 aluminum. Machining this is a treat compared to working with cast aluminum. Polishing is the same way. Forged: In simplest terms, parts that are cast under pressure are called forged. Chances are you will not ever need to polished forged parts. 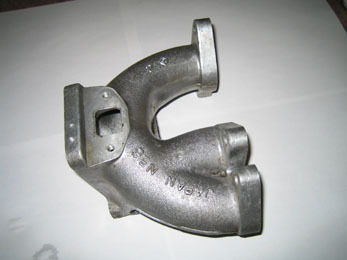 Should you ever need to, forged parts are not porous like sand casting, and the metal is much stronger. Hence you will need more time for sanding and polishing. Each type of metal will have its own method for polishing. You will need to experiment to understand what works best for your application. Take your time. Thoroughly clean the part to be polished. The part should be cleaned and fully degreased. You have a fairly wide choice of cleaning products at this stage. Products such as SOS pads and Castrol Superclean work very well for cleaning but these cleaners and others will actually etch the surface of aluminum and ruin a polished piece. Use them now to get the part thoroughly clean but don’t use them again in this process or any time thereafter. Inspect the part and determine what you want to do with it. You may want to remove casting numbers, casting flash, and rough edges. On the other hand it may be important to you to retain the originality of the part. Generally it is easier to grind down the numbers than it is to try to sand and polish around them. Tools of the trade at this stage are rough and fine files, and 40/80/120 grit sandpaper on orbital sanders or drills. If you need to remove large amounts of material, then a high speed drill/grinder with 40 or 80 grit can be used. A hack-saw or file can be used as well. These are particularly handy for removal of casting flash. Photographs 1&2: Note the curves on this intake manifold are interrupted by casting edges. This piece will look much better with a bit of work with the Dremel tool. If your part has inside ports, holes or other "pockets", take time and mask these off. This will keep out all of the filings and other debris that is common during the polishing. This will avoid the situation of trying to clean abrasive material out of a part after investing so much time getting that mirror finish. Remove pitting resultant from the casting process. If the part is a cast part it will likely have a rough, pitted texture. It will be necessary to remove this. Start with the coarsest grit of sandpaper. Power tools can significantly reduce the effort at this stage. An orbital sander comes in particularly handy but you must be extremely careful as you may not have a clear view of the back-edge of your sandpaper. It is quickest to take off as much as possible with power tools and keep hand sanding to a minimum. As you are still working with relatively rough sandpaper and power tools, wet sanding is neither necessary nor advisable. There are a few inexpensive tools that can greatly ease the process. · Wooden paint stick. Take a large sheet of sandpaper, cut it in half, wrap it around the stick. Tear strips off as the sandpaper gets worn. · Molded trim-sanding blocks available at most woodworking stores. These are really handy for getting into awkward inside curves. · Electric drill with a sticky-backed or Velcro backed sanding disc. Great for removing rough casting but can be difficult to control. Works fast at removing large amounts of material. · Orbital sander. Great for removing casting pits, and sanding flat areas. Leaves small "hook" type lines in the material due to the "orbit". · Dremel Rotary tool. Useful for small work but the sanding rolls wear out fast with metal. Bullet nose felt tips are a must for polishing tight areas. · Dremel Contour Sander. Different shaped biscuits can come in handy for strange shapes. Creates "orbit" sanding lines due to vibration. · Pencil. Wrap sandpaper around it and tear off as it gets worn. · Kitchen sink. Sandpaper works much better if you sand the piece under a trickle of water to keep it clean and free from clogging. · Sanding rolls/drums. Great for getting into corners where a larger sander cannot. Tapered drums are nice. A few other tips that might help. · I have found that not all sandpapers are alike. In fact, 3M seems to work better than others when wet-sanding. Other wet/dry sandpaper seems to lose grit when the glue softens up under water. · Sand under good light. It helps you see the coarser scratches. · Start with a small easy part. Don't tackle a large, difficult, rare piece, for your first effort. Start with something like a thermostat housing. 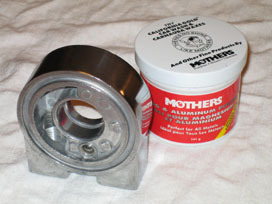 · If you would like to review your polishing progress along the way, you can use Mothers polish in one area after you finish with a grade of sand paper. to retain or remove identifying marks on the piece. try to sand around it. 80-120 grit sandpaper is a good starting point. Anything lower should only be used for removing large amounts of material quickly. Opinions vary on sanding technique. Sanding in the same direction can make it easier to identify deep scratches from coarser grits of sandpaper, but runs the risk of creating deeper grooves to remove. With practice you will end up using the method that you feel works best for you. Stop and clean your sand paper often. If it starts to appear the colour of the metal you are sanding, it is time to replace it. Softer metal like aluminum will plug up sand paper and turn your 120 grit into 40 grit. At this stage the part will have coarse scratch marks, but on inspection should be virtually free from all pitting. Now the process of polishing the part really begins. You will likely want to start with 120 grit wet/dry sandpaper. Sand the part thoroughly until all you can see is thousands of tiny scratches the size of 120 grit sandpaper. My preferred approach is to try to sand in a uniform direction such that most of the scratches look more or less in parallel with each other. Now move up to 240 grit sandpaper. Try sanding across the grain of the 120 grit scratches. You will notice that you can see the coarser 120 grit scratches if you hold the piece up to the light. You need to sand with 240 grit until the coarser scratches are completely removed. Move up to 320 grit and repeat. Once the 240 scratches are completely removed, you can move up to 400 and do it again. From 400 grit, you can usually move directly to the buffing machine if one is available. By now you will have realized that this is a long process and somewhat frustrating. Sometimes you just need to stop, put the part down and come back to it another day. Sanding with the heavy grit provides fast rewards, but when you drop down to 240, you are removing much less material, so it takes longer. Don’t fret. Over time you’ll find you develop your own tools to help you sand your parts correctly and more quickly. Sanding rolls, drums, discs, etc. will all help you. If you don’t have a buffing machine, don’t worry. Simply repeat the process with 600, 800, 1000, 1500, and finally 2000 grit wet/dry paper. As you move to finer and finer sandpaper the process does get a little easier, the part gets shinier, and you start to see the rewards of your efforts. Keep using fresh sandpaper and wet-sand; the few dollars saved scrimping on sandpaper is more than made up in the time saved in the process. The progression of sandpaper will depend on the material you are polishing. The softer the material, the larger jumps you can make. Softer material will also plug up sandpaper faster. Again, you will need to test your method for your part. 1. Clear powder-coating can be quite effective but doesn't always handle high engine heat particularly well. It can yellow after a few years and may peel. Overall, it does protect the finish and can be cleaned very easily. 400 grit . It is ready for the buffing wheel or finer sandpaper. There are a variety of finishing compounds out there and they are all basically similar. By far the most popular is the Mothers brand. Mothers recently released a high-end polish that is considerably more expensive; I haven’t tried it yet but the cheaper polish works fine anyway. For this step you will need clean rags. Dip the rag into the tub of polish, pick up a little, and begin rubbing it in a small area. You will notice the cloth begin to blacken. Rub it in well and then take a clean cloth and rub all the blackened polish back off the piece. Continue this process over the entire piece. You may find that once over is enough but you will get a better finish if you go over the piece two or three times. If what you see is a bright sparkling finish then congratulations! On the other hand if what you see is relatively dull with thousands of scratches of different coarseness, then you haven’t been thorough enough in the sanding process. You will need to go back to the sandpaper. short length of time on the buffing wheel and some ‘Mothers’. If you have the money, then a buffing machine can be a real timesaver. I paid under $450 CDN for the machine, some buff pads, buffing compounds, and a heavy iron stand. This machine has proved more than adequate (it is a ½ hp unit and works on standard 120V) for the job. When using a buffing machine, correct compound and buff selection is the key to good results. A variety are available and it really is as simple as following the manufacturers guidelines. Do not mix compounds between wheels and always clean all residue off a piece before moving on to a different wheel. Failing to do so will contaminate the buffing wheels with coarser compound and they will never work effectively. A buffing machine can also be used to restore chrome and plastic. These aren’t easy to polish by hand (I am not sure it is even feasible). If you have plastic lenses or taillights to polish it may be worth purchasing a buffing machine for these alone. It is also possible to install buffing arbors on inexpensive grinding machines. This works too, but there are some drawbacks to keep in mind. 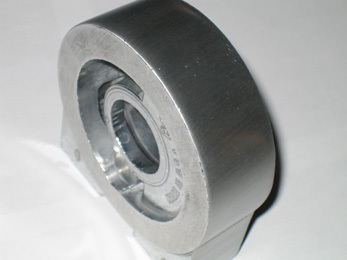 The longer arbors create more side load on the motor bearings when leaning the piece into the buff and you may find that this shortens the life of the motor. This is likely fine for occasional polishing work but may not be suitable for extensive polishing. If longer arbors aren’t used, it becomes difficult to buff pieces as there is very little room to maneuver the piece into the buffing wheel. Also, it may be difficult to find a grinder that works at the right speed. With all this said, you can buy a grinding machine for very little money so it is certainly worth a try. Polishing aluminum is relatively inexpensive if you do it yourself. It isn’t for everyone - it takes a fair amount of time and it isn’t as durable or shiny as chrome. With this said, it has a unique look and can transform an ordinary engine compartment into something ‘extraordinary’.